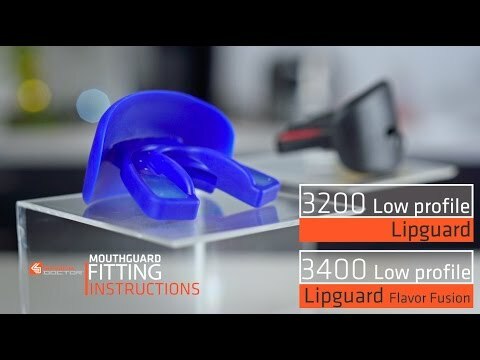 Designed for elite football players, the Low Profile Lip Guard Flavor Fusion is a sleek mouthguard with impressionable gel interior that molds to the bite while protecting both upper and lower lips. Amp up performance during the most intense moments of the game when clenching tends to occur. Low Profile Lip Guard Flavor Fusion is rated 5.0 out of 5 by 2. Rated 5 out of 5 by Diana M. from LOVE THEM!!! I absolutely love the lip guard! It molds to your mouth and allows you to breath with great ease. I bought three of them. Rated 5 out of 5 by Anonymous from Works Great With Orthodontia Devices Great product, is filling a need right where my son needs it most. My 12 year old, almost black belt, just received "springs" added to his braces, they are attached between his teeth and his cheek, so his Shock Doctor braces mouthguard (also an exceptional product) no longer fits as he now needs something without the outside wrap around. We went with this low profile guard since it just has the bite plate and the protection outside his mouth. It fits just like we hoped and allows him to continue his training. It does not disrupt his springs and keeps his mouth aligned. We've been using shock doctor mouth guards almost since the first day of his martial arts training and have been very satisfied with the diverse line and great quality of products. We recommend their products to all the dojo families. Also, the customer service here is top notch. Our original order was lost, I paid extra for the overnight as my son needed this right away after his latest visit to the orthodontist, and it "was lost" according to the carrier, I contacted customer service and they sent another one out right away, arriving the next day. No questions asked, just solid customer support. These days, very hard to find. Will continue to come back and use Shock Doctor as long as we need the protection.